A couple of weeks ago I wrote a post titled Install TensorFlow with GPU Support on Windows 10 (without a full CUDA install). What you are reading now is a replacement for that post. In that older post I couldn't find a way around installing at least some of CUDA. I tried to minimize it by installing only the essential DLL's to make things work. It did require making changes to the "User PATH" which I would rather not have done. I have now found a way around this using only Anaconda Python packages. The focus here is to get a good GPU accelerated work environment for TensorFlow (with Keras and Jupyter notebook) up and running for Windows 10. You will not need to install CUDA for this! In this post I'll walk you through the best way I have found so far to get a good TensorFlow work environment on Windows 10 including GPU acceleration. I'll also go through setting up Anaconda Python and create an environment for TensorFlow and how to make that available for use with Jupyter notebook. As a "non-trivial" example of using this setup we'll go through training LeNet-5 with Keras using TensorFlow with GPU acceleration. We'll get a setup that is 18 times faster than using the CPU alone. I highly recommend you use Anaconda Python. If you need some arguments for using Python take a look at my post Should You Learn to Program with Python. For arguments on why you should use the Anaconda Python distribution see, How to Install Anaconda Python and First Steps for Linux and Windows. The best reason for using Anaconda Python in the context of installing GPU accelerated TensorFlow is that by doing so you will not have to do a CUDA install on the system. Anaconda is focused toward data-science and machine learning. It installs cleanly on your system in a single directory so it doesn't make a mess in your systems application and library directories. It is also performance optimized and links important numerical packages like numpy to Intel's MKL. Go to the Anaconda downloads page https://www.anaconda.com/downloads and get the Python 3.6 version. Open Powershell and cd to the directory where you downloaded the Anaconda installer exe file. In my case that is the Downloads directory. Look up the hash for the file you downloaded. and check that it matches. The installer GUI should now be running. "Select Install Type" I recommend you chose "Just Me" since this is part of your personal development environment. "Chose Install Location" I recommend you keep the default which is at the top level of you user directory. My recommendation is to check both boxes. Make Anaconda Python 3 your default Python. And, as a developer you really should be aware of your PATH environment variable. So yes, go ahead and let the installer add the Anaconda bin directory to your PATH. If you haven't looked at your environment variables in awhile you should have a look. Do a search from the Windows menu for "environment variables". You should find a settings panel that will show your account environment and system wide environment. After the Anaconda install you will see that its application and library directories have been prepended to your user PATH. We'll look at it, and modify it, after installing the CUDA libraries. Next you will be asked if you want to install Microsoft VSCode. VSCode is a really good editor and it is available for free on Windows, Linux and MacOS. However, if you are interested in trying it out I would recommend that you go to the VSCode website and check it out first. If you think you want to try it, then go ahead and download it and install it yourself. I like VSCode but I usually use the Atom editor which also runs on Windows, Linux and MacOS. If you are checking out editors I recommend you try both of these as well as Sublime Text. They are all great editors! If you still have Powershell open you will need to close it and restart it so that it will re-read your environment variables and pick up your PATH which now includes the Anaconda Python directories. With Powershell reopened you can check that you now have Anaconda Python 3 as your default Python. conda is a powerful package and environment management tool for Anaconda. We'll use conda from Powershell to update our base Python install. Run the following commands. It may take some time to do this since there are a lot of modules to update. There is a GUI for Anaconda called anaconda-navigator. I personally find it distracting/confusing/annoying and prefer using conda from the command-line. Your taste may differ! ... and my opinion is subject to change if they keep improving it. If you are new to Anaconda then I recommend you read up on conda even (or especially!) if you are thinking about using the "navigator" GUI. You should set up an environment for TensorFlow separate from your base Anaconda Python environment. This keeps your base clean and will give TensorFlow a space for all of it's dependencies. It is in general good practice to keep separate environments for projects especially when they have special package dependencies. Think of it as a separate "name-space" for your project. There are many possible options when creating an environment with conda including adding packages with specific version numbers and specific Python base versions. This is sometimes useful if you want fine control and it also helps with version dependencies resolution. Here we will keep it simple and just create a named environment and then activate that environment and install the packages we want inside of that. I named the environment 'tf-gpu' but you can use any name you want. You can see that my CMD shell prompt is now preceded by the the name of the environment (tf-gpu). Any conda package (or pip) installs will now be local to this environment. THIS SECTION IS OUT OF DATE!!! My preference would be to install the "official" Anaconda maintained TensorFlow-GPU package like I did for Ubuntu 18.04, unfortunately the Anaconda maintained Windows version of TensorFlow is way out-of-date (version 1.1). There is a current CPU-only version 1.8 for Windows but we want GPU acceleration. A search for "tensorflow" on the Anaconda Cloud will list the available packages from Anaconda and the community. There is a package "aaronzs / tensorflow-gpu 1.8.0" listed near the top that has builds for Linux and Windows. This is the only up-to-date package I know of that is working correctly with Windows 10. This package was built by, and is being nicely maintained by, Aaron Sun. You can check out his GitHub page for the project. Lets install TensorFlow with GPU acceleration in this conda environment. Note that I explicitly use the -c flag to specify the "anaconda" "channel". That would be default if you leave out the channel name but in this case I wanted to be explicit about where the packages came from. The links are, cudatoolkit current is 9.0 and cudnn current is 7.1.4. You should check version numbers when you install. That's it! You do not need to do a CUDA install on your system. Yea! PATH's are correct and everything is working. You can see that it is has GPU support. Next we will do something a little more useful and fun with Keras, after we configure Jupyter notebook to use our 'tf-gpu' environment. You can work with an editor and the command line and you often want to do that, but, Jupyter notebooks are great for doing machine learning development work. In order to get Jupyter notebook to work the way you want with this new TensorFlow environment you will need to add a "kernel" for it. (tf-gpu) C:\Users\don>python -m ipykernel install --user --name tf-gpu --display-name "TensorFlow-GPU"
With this "tf-gpu" kernel installed, when you start Jupyter notebook you will now have an option to to open a new notebook using this kernel. In order to check everything out lets setup LeNet-5 using Keras (with our TensorFlow backend) using a Jupyter notebook with our "TensorFlow-GPU" kernel. We'll train the model on the MNIST digits data-set and then open TensorBoard to look at some plots of the job run. You now have Keras installed utilizing your GPU accelerated TensorFlow. From the 'New' drop-down menu select the 'TensorFlow-GPU' kernel that you added (as seen in the image in the last section). You can now start writing code! Following are Python snippets you can copy into cells in your Jupyter notebook to setup and train LeNet-5 with MNIST digits data. That was a model with 1.2 million training parameters and a dataset with 60,000 images. It took 1 minute and 26 seconds utilizing the NVIDIA GeForce 1070 in my laptop system! For reference it took 26 minutes using all cores at 100% of the Intel 6700HQ CPU in that system. That's an 18 fold speedup on the GPU! I tried following your tutorial to the "t", but had issues loading the DLLs. However, it appears the official Anaconda TensorFlow-GPU library has been updated. I tried using the official version and it worked for me. Yes, that happened after I wrote this. They finally update that! That is definitely the way to go. However, I will warn you that sometimes opencv can be troublesome. There are lots of capabilities that can be compiled in and occasionally people have trouble with various builds. If the default install listed above give you trouble then you can try uninstalling that and try this other build. thanks for posting that! It seems like every time I have needed openCV I've had to dig around for a build with what i need linked in or just build it myself. Wow, this actually worked. I am amazed, after a couple of hours banging my head to the wall, I now have a GPU device working with tensorflow. Huge thanks! Well I would highly(!) recommend to intall original python 3.6 from python.org, then its better create separate python virtual enviroment for tensorflow-gpu and packages you need. After activating virtual environment, install packages over pip: tensorflow-gpu, then keras, install packages you need (like jupyter, ipykernel, scikit-learn, matplotlib, pydot and etc.) . You can use method of installing nvidia's dll as described in this article or packages by pip. Also please pay attention on the version requirements of python and cuda dlls are provided by tensorflow. You have a good point about some of the builds on Anaconda cloud. It is especially a problem for Windows versions. I've had Linux packages that did what I needed and then pulled the Windows version only to find it's out of date or wasn't linked with the lib I needed. I've used both python.org python and envs and Anaconda with conda. There are some things that bug me about anaconda but overall it is an incredible service they are doing. I haven't hit many problems lately and I am 99% on Linux. I have had to do pip installs in anaconda envs and that works fine really. Yes, agree. Francois Sholle says that builds for Windows (i think he meant to say it about Anaconda) are kind of 'big mistake'. And mostly they recommend install APIs by pip. Thanks for the message! The problem is that it if you try to install TensorFlow in Windows without using Anaconda you are going to have to install CUDA too. And that is a not fun on Windows. If you can use Anaconda, especially on Windows, it can make the difference between getting some work done or just being frustrated. If you go with pip packages then you have to have whatever external environment is need by it i.e. with multiple packages you could end up needing different version of CUDA installed. The Anaconda packages can eliminate that dependence. The key is in the line "ImportError: DLL load failed ..." that is telling you that your PATH and or LD_LIBRARY_PATH is not right. I've mostly seen that in Jupyter notebooks when I have forgotten to create (and then use) a Jupyter kernel for the python environment I'm trying to use. Also, it looks a bit like you have multiple versions of stuff installed (maybe multiple Python distributions) ?? I'm not sure why anything would be looking your AppData\Roaming\Python path. Check your PATH variable ??? I installed the tensorflow-gpu using the anaconda navigator method. Just ticked the tensorflow-gpu in the env tab and it installed everything, this worked for me but it worked for only one day, my gpu was getting detected by tensorflow and was being used by python. But the next day when I tried to run tensorflow again, it gave me the exact same error as gokul s , I did not update anything or change anything. first using Aaron Sun's tensorflow-gpu, which created a couple of upgrade/downgrade messages during install of the anaconda channel cudatoolkit and cudnn. third trying the cudatookit/cudnn from the default rather than the anaconda channel. If you would be kind enough to suggest some additional diagnostics, share the location of the files that are in the cuInit call, or provide any feasible path forward, it would be greatly appreciated. Hi Colin, There are a couple of things that could be giving you trouble (all related). It usually comes down to a PATH problem. How you start your Python environment makes a difference. If you start a dos shell from the anaconda GUI it sets your PATH for that shell and you still need to "activate" your the environment. If you try to use Powershell (which I really like) you can't load environments! You have to use the "dos" command in PS to switch how it reads environment vars and such and then you can activate. Also, if you start up a Jupyter notebook you have to remember to do so from a shell that has the proper env activated and you still have to then open a notebook using the proper kernel. Other problems are usually PATH related too. If the environment you are can't find the cuda libs you will get a cuinit error. That can also happen if a program can't find the NVIDIA driver libs! This is a big problem on laptops because of that power saving junk that switches back to on-board Intel graphics. There are two uses that often end up in PATH messes: Developers and system administrators. As a developer you have to constantly be aware of how lib/dll's are linked and what your local shell see for PATH and DLL paths. Thanks Donald, I activated the environment from the command shell and looked for the cuda and nvidia dlls in the path. Found two nvidia dlls in the system32/bin folder (nvcuda.dll and nvcuvid.dll), so these nvidia libraries seem to visible from the tensorflow environment (i called mine cw-gpu). Then i confirmed that nvrtc64_90.dll, nvrtc-builtins64_90.dll, nvToolsExt64_1.dll, nvvm64_32_0.dll, cudnn64_7.dll and cudart64_90.dll were visible in the directory Anaconda3\envs\cw-gpu\Library\bin. I appreciate that you are not familiar with windows, but do these look like the Cuda and Nvida driver libraries that I need in my path? (hope the naming is similar on linux) Any guidance is appreciated. Try this, open the Environment settings panel and see what is set in there for your PATH. That tool has a nice editor. Move anything there to a position below the Anaconda path settings. Then open up a new shell and try again. I think that will work. ??? It may require a reboot?? >conda install -c anaconda cudnn ==> All requested packages already installed. When I tried to import tensorflow, it failed with the same missing DLL error. Reinstalled tensorflow and cuda packages and received the same update messages. Tried the test script, and it worked! I include this detail in case some one else has the same issues. This is amazing. Made my day. I've used Dell XPS 15 9560 and try to install GPU support for Tensorflow and Pytorch on Win10. Spent three days meeting all (all) kinds of trouble, version issue, installed tensorflow but it still use CPU, a lot of issues. Following your instruction, I made it in one hour! Kudos to you. I followed your tutorial, but when I entered "sess = tf.Session()", I got the following and then no mention of the GPU (I also have a GeForce GTX 1070). I've struggled for weeks trying to get TF working with my GPU. I would be most grateful for any suggestions! That message is OK. The first thing TF does is run that cpu_feature_guard code. It checks the capabilities of your processors and then then tells you about any features that are present that it wasn't compiled against (or that are missing that it was compiled against) By default TF is not linked to AVX (or any CPU vector libs) It gives you that warning when it starts up. It's what comes after all of those messages that's important. python -c "import tensorflow as tf; tf.test.gpu_device_name()"
Hi Donald. I tried that, and just got the same "CPU supports AVX2" message, and then it dumped me back out to the tg-gpu command prompt with no mention of the GPU. I can see the GPU in windows task manager, so it's definitely physically connected. I've also ensured that the GPU has the current drivers installed. I'm sure that there's something obvious that I'm missing. I'd really appreciate any suggestions for what to try next! open an Anaconda Shell and then activate tf-gpu, then start python and do that from ... timport command followed byt the device list thing. physical_device_desc: "device: 0, name: GeForce GTX 1070, pci bus id: 0000:01:00.0, compute capability: 6.1"
Internal: cudaGetDevice() failed. Status: CUDA driver version is insufficient for CUDA runtime version.. File "C:\Users\cvbrun\Anaconda3\envs\tf-gpu\lib\site-packages\tensorflow\python\client\session.py", line 626, in __init__self._session = tf_session.TF_NewSession(self._graph._c_graph, opts)tensorflow.python.framework.errors_impl.InternalError: Failed to create session. Ah thanks!! :) Yea got it to work using a config option for tf.session but trying to get openCV working on windows defeatead me :) Had to throw in the towel after 5-6 hours of moving dll and wheel file and whatever else around. Will be building a sweet ubuntu 18 PC soon so looking forward to that. sorry I did not quite get how you solved it. can you explain in more details? Thanks. I was running into a lot of problems but your tutorial was simple and ran like a charm! Thank you! that is really helpful. I did all what you said, and now the TensorFlow works if I used Jupyter Notebook, It doesn't work if I use spyder. I get that error when I run Tenserflow on Spyder "
ModuleNotFoundError: No module named 'tensorflow'"
and now I'm using spyder(tf-gpu). Really thank you. I've been trying to install tenserflow- gpu for a week. Thanks for your tutorial! I was thinking it was something with the env not getting set for Spyder ... glad you worked it out! Donald - I re-installed Windows on the PC and then followed your instructions with the fresh machine. Worked perfectly! Thank you so much for this tutorial! Great! I'm sorry you had to do a fresh install but honestly it's often the easier thing to do! I'm pretty quick to do reinstalls (Windows and Linux both). I keep good backups of important stuff and try to keep my overall systems as "clean and lean" as possible. The installation text code and tensorboard visualization works fine. My question is: have you tried using CuDNNGRU or CuDNNLTSM? UnknownError: Fail to find the dnn implementation. Yes, good, what you did using the new Anaconda TF package is the way to go. Hi Donald, just to let you know that this made my day. worked liked a charm. fortunately, I landed on this article in couple of hours after building a new pc with GPU(RTX 2070). Back of my mind, I was hating to get ready for days/weeks of reading, trying and errors. I am really impressed with the details that you have provided and replied in the detail on diferent comments. Huge kudos to you. I was banging my head since 3 weeks on my new laptop trying avrious things and now only got something working, thanks to you. Great community work indeed. Tensorflow resisted any reasonable effort. Finally I found this tutorial and all went smoothly with Python 3.6 (from Anaconda) and the suggested CUDA 9 libraries. Donald - you are amazing! Thank you so much for all the details in your blog. I was having some issues to make it work unless I found your post. One small note, if someone is curious to know what is the current GPU usage, then apart from using NVIDIA System Management Interface (nvidia-smi), is there any other way to see that? What a miracle that I found this post and instruction! Seriously, it meant a lot to me. I had bought an ASUS laptop with a 1070 GPU and intended to install Ubuntu but for some reason it didn't work out on that machine, so instead I tried to do a Win10 keras/tensorflow installation and got very frustrated. However, the installation described by Donald took less than an hour and worked right away. The only issue I found, was that I had to create a new Windows local account without space in the login ID. Anaconda doesn't like spaces in the User folder names. Now I have a clean Windows installation and a clean Tensorflow/Keras installation. Thanks so much, Donald. Everything works fine with Jupyter. What if I want to use Spyder? If I start Spyder from the command prompt with tf-gpu activated, it won't find the modules keras, cv2, etc. Any hint on how to get Spyder working too? yes of course, sorry that I overlooked it. You just have to to "conda install spyder" while in the tf-gpu environment and it works right away. Super! ImportError: Could not find 'nvcuda.dll'. TensorFlow requires that this DLL be installed in a directory that is named in your %PATH% environment variable. Typically it is installed in 'C:\Windows\System32'. If it is not present, ensure that you have a CUDA-capable GPU with the correct driver installed. python -m ipykernel install --user --name tf-gpu-new --display-name "TensorFlow-GPU-New"
Hello, thanks for your tutorial. What you means here is that we only run those codes in Anaconda Prompt environment without installing Cuda and Cudnn because they are already included, right? Fabulous tute Donald that's worked a treat ! Can not thank you enough as it's ended days of frustration for me following a thread on the nVidia forums. Are you still thinking of doing the latest follow up as per your last comment? I'm only asking as I'll be doing this on another machine (or two) and thought I'd wait for the latest streamlined version. Happy 2019 to you and thanks again ! You're a true gentleman and a scholar Donald. I am so grateful Dr Donald Kinghorn. This is the by far the best Tensorflow GPU on Windows Tutorial I have ever seen. Much Thanks. Thank you very much for this very nice and vary useful tutorial. that looks like it is not seeing your NVIDIA display driver or the display driver is too old to support the version of cuda and cudnn ... I'm not 100% sure of this! Check you NVIDIA driver version and be sure it is at least 410 version. If you are using a laptop you could be seeing some trouble from the initialization not switching from Intel to NVIDIA. I don't have much experience with that but a right click on your desktop should have an item for switching the cards. ... I'm not sure ... it looks like the 1060 is starting up OK but there is some conflict with versioning. Your article is very wonderful. It solved my two weeks troubles. I tried it on Ubuntu 18.04 today and it worked fine. I really appreciate it. I will comment a little. · Cuda10 has been released at the present time, but tensorflow-gpu did not work with cuda10. It is better to designate 9 to install. · It may be more friendly to write the method of installing the nvidia driver. I appreciate the wonderful article. Thank you so much for this post. It saved my life. I had some problems before I got it to work. So I am here to say thank you and share my fix since I noticed some people are facing the same problem. 1- Uninstall all the stuff after the step where you "Create a Python "virtual environment" for TensorFlow"
Good luck to all and Big thank you for you Donald Kinghorn !!!!! Followed all the steps in this post including creating the notebook kernel for the tensor flow environment. When opening Jupyter notebook, selecting the Tensorflow-gpu kernel the example code runs without any error messages but it is using the CPU and not the GPU. How do I get Jupyter notebook to use the GPU? How do I get Tensor flow to recognize and use the GPU??? and start Jupyter notebook from there. Followed tutorial. No luck, my install does not see or use the GPU. I have a GTX 1080 so it should work. If anyone knows of a tutorial that results in the GPU being recognized and used I'd love to see it. Thank you Donald! This was very very helpful! As a note to anyone who had previously installed the Cuda toolkit, you may need to rollback your drivers to get this method to work. Thanks a lot Sir for the tutorial. I was struggling for around 2 weeks to install tensorflow-gpu. But now it's all setup. Before this I just followed Tensorflow official guide, wherein I was installing CUDA and tensorflow-gpu using pip ,and setting up cuDNN by copying it's files into CUDA directory. And then setting the required PATH variables. But it didn't helped. Tensorflow is not providing good compatibility over all environments, and that's sad. After following your tutorial I successfully install everything, without doing any other external stuff, but I chose to install official Anaconda distribution for tensorflow-gpu which installed cudatoolkit-9.0 and cudnn=7.1.4 implicitly. You are welcome! I am a little disappointed that the TensorFlow team is not being more friendly toward Anaconda since it pretty much the default Python environment for machine learning! I do understand why they are doing things the way they are though. It's a big project with a lot of developers making contributions. With a "pure" Python approach it is probably better to use python.org stuff and pip. For "real world" "workstation" usage it makes a lot more sense to use Anaconda. Thankfully, the folks at Continuum are doing a really good job with Anaconda! ... it would be nice if the TF folks would acknowledge that. Thanks for a great article. I have a questions. I have "NVIDA GeForce gtx 1050" in my notebook and my gpu is not supported by CUDA for the notebook. Can I still use your method to use my gpu to train deep learning (tensorflow-gpu)? Thanks so much for your help in advance. That should work fine. I have a 1060 in my laptop and it is not too bad the 1050 will certainly work (I considered a nice Dell XPS with the 1050 in it but got one of the "gamer" series instead). The 1050 is not super powerful but it will run cuda code just fine. It is "Pascal" same as the (great) 1080Ti but it just doesn't have as many cores or memory. The needed DLL's will be installed along with tensorflow by conda local to the directory for the environment. The "runtime" libraries to execute the CUDA calls comes along with your display driver. So as long as you have the NVIDIA driver installed it should work. In fact it should be automatic, by that I mean even if you are running on the Intel display when you start up a job that calls CUDA it should switch to the nvidia driver by itself. Also, take note that I am going to GTC next week but after I'm back doing a refresh on this post is a priority. If you want to go ahead and do your setup now you should be OK but take a look through some of the recent comments for some hints on having a more up-to-date install. Sir Donald first of all thank you for this post.just like all me too followed each and every steps you written. does my gpu (GTX 1050ti) only supports cudnn 9 not 7? do i have to explicitly download cuda 9? Sir , i am a student , Help me to understand and Resolve this DLL things as soon as possible . I've been away at GTC this week ... One thing that is nice about using conda is that is that it's easy to start over if something doesn't go right. and do the first test i.e. If this works then you should be able to create a jypyter notebook kernel and get started. First of all, thanks for a wonderful discussion and all the recent updates. But I am having troubles getting the latest procedure for installing tensorflow-gpu working on a Windows system. I followed the instructions for installation without a previous installation of cuda or cudnn. I have installed the latest version of Anaconda. My GPU card is NVIDIA P600, which seems to be compatible. The driver is the latest offered by NVIDIA.Your procedure seems to go normally and I can import tensorflow in Python. 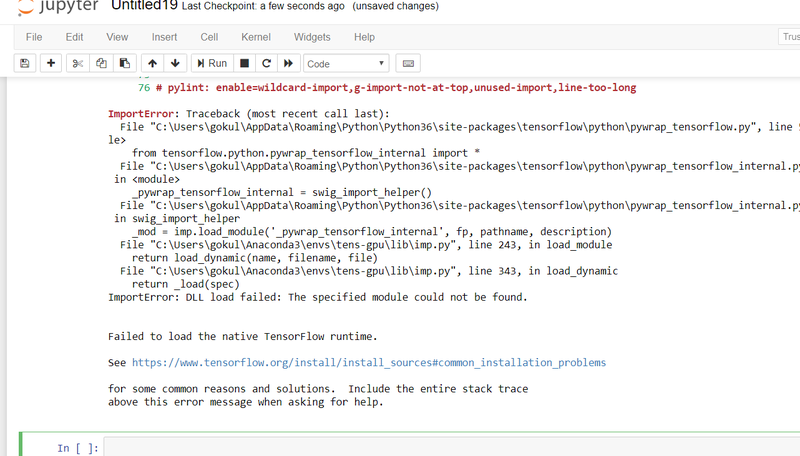 When I try to execute tf.Session(), python recognized the gpu as device 0, but then throws an error as shown in the following screenshot. Hummm, this is puzzling. That message is usually from the display driver being to old to support the cuda runtime dependency of the code you are trying to run. But you say below that you have the latest driver installed. The driver is obviously running since TF sees that card. I just looked a NVIDIA's driver site for this card ... be sure you have the ‘Optimal Drivers for Enterprise’ (ODE) version installed. Try that driver and then be sure you are installing with conda install tensorflow-gpu keras-gpu instead of using aaronz's build. And do NOT install the cudatoolkit or cudnn packages. You also could be hitting some strange laptop related issue. They can be problematic sometimes. I hope that is not the case! It was the video driver after all. I replaced the existing drive with a driver dated 3/20/2019. Everything was well after that. Thanks for the assist! Hi Jing, This has be coming up a lot lately. It is usually caused when your NVIDIA display driver is too old or not loaded. I recommend that you go to the nvidia driver web site and get a newer driver and manually install it. That should take care of the problem if is from an out-of-date driver. If you are getting that error because your driver is not loading then it can be more difficult to figure out what is causing it. The most common problem for this case is when you are using a laptop and it is defaulting to Intel graphics and not switching over to the nvidia display driver when you start tensorflow. That is supposed to happen automatically but it doesn't always seem to work. 1) see if you can manually switch your display to nvidia. Right click on your desktop and see if there is a menu item there for NVIDIA Control Panel you shoould be able to force the display switch with that. If it does then do ctrl-D to exit out of python and then start jupyter notebook that notebook really should be able to see your gpu at this point. After I update the NVIDIA driver, it works.Thank you so much! Everything worked fine on Windows 10 with a pair of GTX 1080's. It ran the 15 Epochs and showed a 99.44% accuracy, etc. But I was unable to make the last little leap to the Tensorboard visualization. When I run "tensorboard --logdir --port 6006" it comes back with a "usage" dump. It seems to want a specific logdir value but I don't know what to tell it. Also I don't know where (or if) the Jupyter notebook wrote a logfile...did I need to do something to make that happen? 1) set the directory that will be used in the "callback". Data will get written there. That helped, since tensorboard now has something to work with. It said I should g to "http://DESKTOP-428EPG2:6006". Do I just put this in my browser address window? I've tried that various ways and Chrome can't find it or can't connect. It works in Firefox.but not in Chrome or MS Internet Explorer. Good enough. Linux under the hood I'm guessing. Also, there were some warnings. These didn't hurt anything but next time you're doing cleanup it might be helpful. WARNING:tensorflow:From C:\Users\Rikk\Anaconda3\envs\bigfoot\lib\site-packages\tensorflow\python\framework\op_def_library.py:263: colocate_with (from tensorflow.python.framework.ops) is deprecated and will be removed in a future version. WARNING:tensorflow:From C:\Users\Rikk\Anaconda3\envs\bigfoot\lib\site-packages\keras\backend\tensorflow_backend.py:3445: calling dropout (from tensorflow.python.ops.nn_ops) with keep_prob is deprecated and will be removed in a future version. WARNING:tensorflow:From C:\Users\Rikk\Anaconda3\envs\bigfoot\lib\site-packages\tensorflow\python\ops\math_ops.py:3066: to_int32 (from tensorflow.python.ops.math_ops) is deprecated and will be removed in a future version. Thanks! I will be redoing this post soon. It's seems to have been helpful to a lot of people so I will try to be as thorough as possible to have a clean detailed setup and test in the refresh.